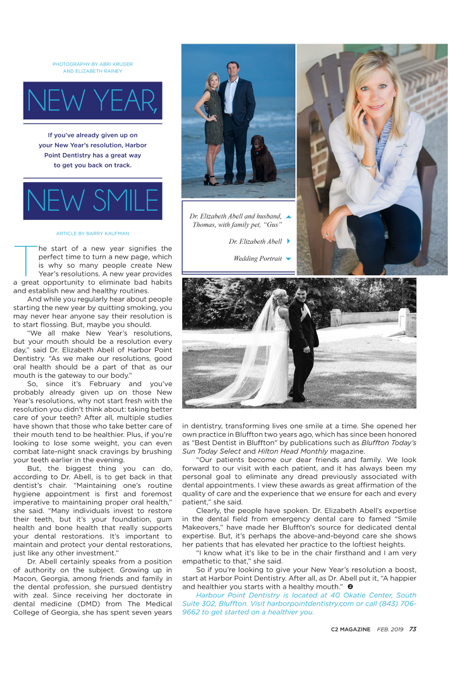 Hilton Head Magazines: CH2/CB2: New Year, New Smile: If you’ve already given up on your New Year’s resolution, Harbor Point Dentistry has a great way to get back on track. The start of a new year signifies the perfect time to turn a new page, which is why so many people create New Year’s resolutions. A new year provides a great opportunity to eliminate bad habits and establish new and healthy routines. And while you regularly hear about people starting the new year by quitting smoking, you may never hear anyone say their resolution is to start flossing. But, maybe you should. So, since it’s February and you’ve probably already given up on those New Year’s resolutions, why not start fresh with the resolution you didn’t think about: taking better care of your teeth? After all, multiple studies have shown that those who take better care of their mouth tend to be healthier. Plus, if you’re looking to lose some weight, you can even combat late-night snack cravings by brushing your teeth earlier in the evening. Dr. Abell certainly speaks from a position of authority on the subject. Growing up in Macon, Georgia, among friends and family in the dental profession, she pursued dentistry with zeal. Since receiving her doctorate in dental medicine (DMD) from The Medical College of Georgia, she has spent seven years in dentistry, transforming lives one smile at a time. She opened her own practice in Bluffton two years ago, which has since been honored as “Best Dentist in Bluffton” by publications such as Bluffton Today’s Sun Today Select and Hilton Head Monthly magazine. “Our patients become our dear friends and family. We look forward to our visit with each patient, and it has always been my personal goal to eliminate any dread previously associated with dental appointments. I view these awards as great affirmation of the quality of care and the experience that we ensure for each and every patient,” she said. Clearly, the people have spoken. Dr. Elizabeth Abell’s expertise in the dental field from emergency dental care to famed “Smile Makeovers,” have made her Bluffton’s source for dedicated dental expertise. But, it’s perhaps the above-and-beyond care she shows her patients that has elevated her practice to the loftiest heights. “I know what it’s like to be in the chair firsthand and I am very empathetic to that,” she said. Harbor Point Dentistry is located at 40 Okatie Center, South Suite 302, Bluffton. Visit harborpointdentistry.com or call (843) 706-9662 to get started on a healthier you. Amie Baima: Energetic, Enthusiastic & Entrepreneurial!